Teatru Astra, with the support of Bank of Valletta, is proud to announce the fifteenth edition of Festival Mediterranea, a series of cultural events to be held in Gozo between the 17th of October and 19th of November 2016. This year's festival was officially launched during a press conference addressed by Mr Mario Mallia, Bank of Valletta's Chief Executive Officer, Mr Michael Formosa, Chairman of Festival Mediterranea organising committee, Prof. Mro Joseph Vella, the Artistic Director of the Festival and Mr Albert Marshall, the Malta Arts Council Chairman. Congratulating the organisers for the upcoming edition of Festival Mediterranea, Mr Mallia said, "A lot of dedication and hard work goes into this month-long series of activities that blends together so many art forms, including opera, music, dance, history and archaeology. Bank of Valletta is proud to have been supporting this event year on year, and witnessing it grow from its first edition. Today, Festival Mediterranea has established itself as a milestone in the cultural calendar. We strongly believe in the value that these initiatives bring, not only to Gozo but also to our national cultural heritage, kindling a love of the artistic world among our people, while putting the Maltese islands on the international cultural scene." 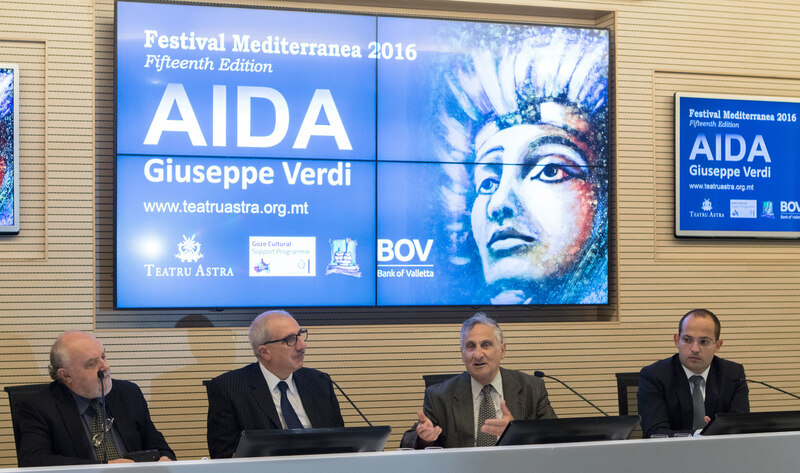 Michael Formosa, the Festival Chairman, stated that Teatru Astra is proud to announce the fifteenth edition of Festival Mediterranea and the opera Aida, the third time the theatre is producing this opera, after introducing Verdi's ever-popular masterpiece to the local public way back almost three decades ago. 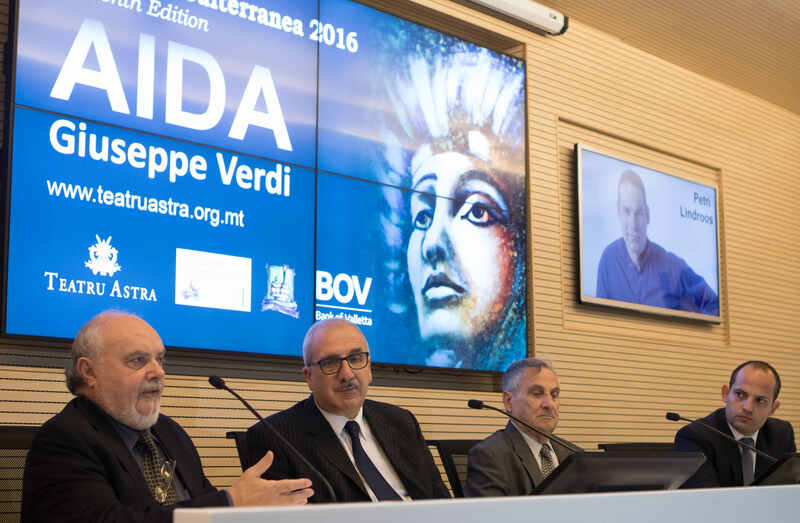 He stated that the forthcoming opera, a completely new production of Verdi's flagship Aida, promises to be a dazzling production that will continue to place Teatru Astra on the same footprint of major European regional theatres, marking a journey the theatre went through since putting up the first Aida in 1988. Mr Formosa commented on the enthusiasm and commitment of volunteers, which underpin every opera production at Teatru Astra, a phenomenon that continues to be as strong as it was way back when the first Aida had been produced at the same theatre. He stressed the opportunity the theatre is giving to local talent and the contribution the one-month-long festival gives the local business community. Prof. Joseph Vella explained that Aida is the essence of Italian opera par excellence - soothing melodies, great choruses, scintillating solo voices, and ballet scenes, all wrapped up in an intriguing story line set in the wonderful, exotic scenario of ancient Egypt. Prof. Vella stated that this is the third production by Teatru Astra of Aida, an opera that seems to never lose its allure among opera lovers. He also explained how Teatru Astra has always invested heavily in world-class singers and a choir (under the direction of Maria Frendo) whose reputation has established itself as one of the foremost opera choirs on the islands. He concluded that this year's production promises to be another memorable event in the now well-established operatic tradition which has made Teatru Astra's productions so sought after and so generously patronised. Mr Albert Marshall, Executive Chairman for the Malta Arts Council augured Teatru Astra success for the opera Aida and reiterated that through the Gozo Cultural Support Programme managed by the Malta Arts Council and the Ministry for Gozo, the opera in Gozo is increasingly being supported to continue developing. Mr Marshall stated that this is being done because the Malta Arts Council believes that cultural organisations in Gozo, like the Soċjeta Filarmonika La Stella, are increasingly producing events of excellent artistic quality which continue to attract local and foreign audiences. The opera AIDA will feature in a double representation on the 27 and 29 October at 19.30hrs. Teatru Astra is once again presenting a star-studded line-up to what promises to be an outstanding Aida. Alongside Verdi heavyweight Carlo Colombara, the cast features Silvia dalla Benetta in the title role. Sanja Anastasja, a new-comer to the theatre, will be interpreting the role of Amneris. The role of Radames will be interpreted by Antonino Interisano. After the success in the 2015 La Boheme, Devid Cecconi will be making a welcome return in the role of Amonasro. Petri Lindroos is billed for the role of the King of Egypt. Enrico Stinchelli, of La Barcaccia fame, will once again be responsible for the artistic production. As in past years, scenery will be designed and built by Joseph Cauchi and his team, while Emanuel Grima and George Farrugia will be in charge of costumes. Teatru Astra will be renewing its collaboration with the Teatru Manoel in the organisation of an opera workshop on Monday 17 October at 19.30 hours. The event is free of charge. Opera patrons who will be visiting Gozo during the opera weekend will have the opportunity to attend a number of other events, namely, a recital on Friday 28th of October at the Kempinski San Lawrenz Resort and Spa, featuring three La Stella Band Soloists; Mario Galea (clarinet), George Camilleri (Euphonio) and Robert Buttigieg (Trumpet) and a lecture on the opera AIDA delivered by Dr Abraham Borg. This event, titled ÃÃÂ¢Hymn to doomed love' is scheduled on Saturday 29 at 10.00 hours at Banca Guiratale in Victoria. Both events are free of charge. Teatru Astra will be hosting a trio and a quartet from Sweden in a lunchtime concert at Aula Mgr Farrugia in St George's Basilica on Thursday 3 November. The events include a lecture by Dr Paul George Pisani, The Hospitallers as Historians billed for Friday 5 November at St Cecilia Chapel, a piano recital by the young and talented pianist Francis James Camilleri on Saturday 5 November at Aula Mgr Farrugia, and an onsite lecture titled ÃÃÂ¢Towards an Innovative and Modern Sensibility in Art in Gozo' delivered by Dr Mark Sagona on Saturday 12 November. During the festival Il-Ħagar Museum will be hosting an exhibition which will place a spotlight on the new exhibits which were recently acquired by the same museum. The La Stella Philharmonic Band will close the fifteenth edition of Festival Mediterranea in a classical concert featuring diverse pieces, from the traditional to the contemporary. This annual grand concert is billed for Saturday 19 November 2016. The band will be directed by Prof. Joseph Vella. The opera AIDA is supported by the Gozo Cultural Support Fund, managed by the Malta Arts Council.